This write-up has plagued me for a little while. I just hate these “district” designations, as they encompass far too much for my little brain to process. There are two others on the list of 60 – in Litchfield and Manchester – and I think this one here in New Haven has the most “stuff.” The truly annoying part of this is that while I’ve been on the green maybe ten times and have driven or walked along a bordering street maybe 25 times, I haven’t really snapped a ton of pictures, nor would I really know what to snap pictures of. So, I’ll use a few of my own terrible shots and then rely on other, far more talented photographers to fill in the blanks. And while I’m at it, I might as well just use Wikipedia’s words (to a large degree) as well. Please note, I interject stuff all over the place, so this page doesn’t read like a boring old Wiki page. But first, a little bit about these district designation things. A historic district is a contiguous grouping of buildings or sites that share thematic historical significance and periods of construction. Examples include residential areas, commercial districts and industrial complexes. The city of New Haven currently has twenty-four historic districts: three which are locally designated; five which are listed on the State Register of Historic Places; and nineteen which are listed on the National Register of Historic Places. Many of these districts have all three levels of recognition, while others stand independently. Do you see how crazy this all gets? Of course, we only care about one. Onward to the Green! The New Haven Green is a 16-acre privately owned park and recreation area located in the downtown district of New Haven. 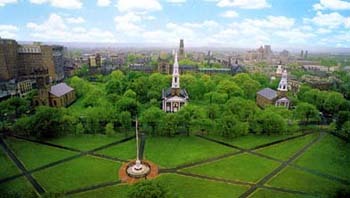 It comprises the central square of the nine-square settlement plan of the original Puritan colonists in New Haven, and was designed and surveyed by colonist John Brockett. The green is host to numerous public events, such as the Festival of Arts and Ideas, summer jazz and classical music concerts that can draw hundreds of thousands of people, as well as typical daily park activities. 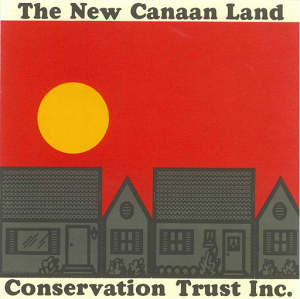 As New Haven Green Historic District, it was designated a National Historic Landmark District on December 30, 1970. It’s safe to assume that “hundreds of thousands” number is “over time” not all at once. The Green is a traditional town green and was originally known as “the marketplace”. It was completed in 1638. The Puritans were said to have designed the green large enough to hold the number of people who they believed would be spared in the Second Coming of Christ: 100,000. Wow, that’s pretty cool if that’s true. Wikipedia had that infamous little citation stating, “citation needed.” I don’t feel like looking it up, because I choose to believe our Puritan forefathers were just as insane as today’s End Timers. In its early years, the Green held a watch house, a prison and a school. 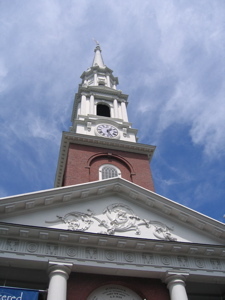 The upper Green also once held the First Methodist Church. The church was removed from the Green in 1848 with a new church built across Elm Street. 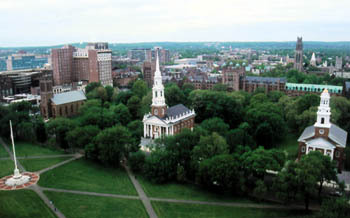 The Green also held a succession of statehouses, dating from the time when New Haven was joint capital of Connecticut with Hartford. The most recent state house was erected in 1837, designed by Ithiel Town in a Greek Revival style. Ultimately, Hartford was declared the sole capital and the building was demolished in 1889. 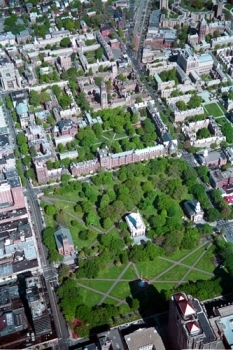 The Green served as the parade grounds for the New Haven militia, who, under the leadership of Benedict Arnold, rushed to Massachusetts after hearing of the Battle of Lexington and Concord and participated in the Battle of Bunker Hill in the American Revolution. This indirectly led to the burning of most of the city by the British when they landed in New Haven in 1779. It’s little ditties like that that make New England better than everywhere else in the US. Next time you’re smoking dope listening to Tito Puente cover music on the Green avoiding eye contact with all those homeless guys milling about, remember that bit about ol’ Nutmegger Benedict Arnold. What’s that? You didn’t realize he was born and raised in Connecticut? For shame, as CTMQ has been to his birthplace. The Green was used as the main burial grounds for the residents of New Haven during its first 150 years, but by 1821 the practice was abolished and many of the headstones were moved to the Grove Street Cemetery – another National Historic Landmark (CTMQ visit here). However, the remains of the dead were not moved, and thus still remain below the soil of the Green. 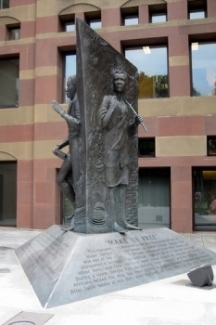 It is estimated that between 5,000 and 10,000 people remain buried there, including Benedict Arnold’s first wife, Reverend James Pierpont (founder of Yale University), members of President Rutherford B. Hayes’ family, and Theophilus Eaton, one of the founders of New Haven and was governor of the New Haven Colony for 19 years. Whoa man, that’s crazy. Seriously? If you weren’t smoking the dope dancing to free music on the Green, you are surely tripping now. Also, a small portion of the burial ground is now preserved in the The Center Church Crypt – which is one of the cooler things to see in the entire state (CTMQ Visit here). 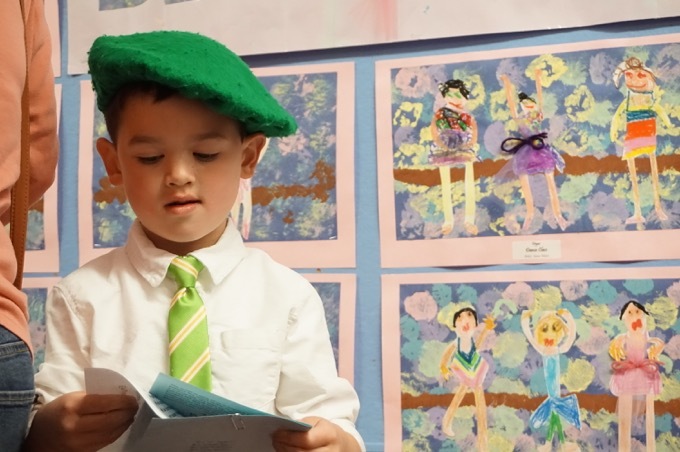 Descendants of the city’s original settlers maintain ownership of the green. There are five members of the committee that oversee the large, main portion of the green. Today’s committee members — called proprietors — are drawn from the ranks of prominent city residents. Members are appointed for life, and when one dies the four remaining members convene in private to select a replacement. Well, that’s just creepy. But what can we expect from the home of the Skull & Bones Society? Located on the upper Green are three historic early 19th century churches which reflect the city’s theocratic roots. While once the edges of the Green were covered with a glorious canopy of elms, planted originally by James Hillhouse, most died of dutch elm disease. 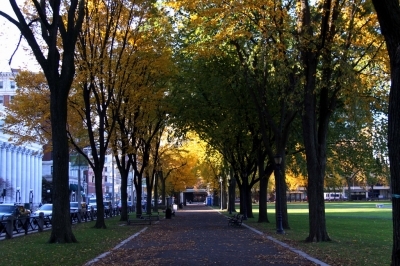 In the 1980s, disease-resistant elms were planted in an effort to memorialize the legacy of the trees that gave New Haven the nickname “Elm City”. Bordering the Green are municipal, commercial and university structures. 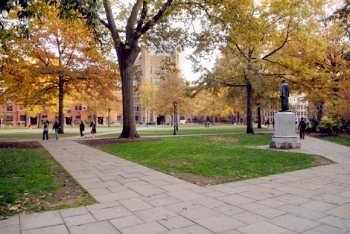 On the northwest side of the Green, across College Street, stand Phelps Gate and the Yale University buildings bordering Old Campus. Before the Old Campus was built, the buildings of Yale’s Old Brick Row bordered the Green here. There happens to be another National Historic Landmark over there: Connecticut Hall (CTMQ visit here). Wikipedia goes on to describe the other bordering buildings, but I didn’t find anything to broadly interesting, so I’ll end it here. I’ll pick some of this stuff up again when I do a Yale tour, which I’ve heard is a pretty cool way to spend an afternoon. As I understand, Isaac Allerton, one of the Mayflower passengers, is buried there. I think one should warn people to keep their guard up during the visit. The lovely old churches are deceptive, and lulling to see. The overdoses today established that on an ordinary day, at least 76 drug addicts were using the Green. When I taught at Yale we told students that men should never cross the Green at night, and women should never go there during the day. But it looks so lovely and proper one can forget where one, in fact, is.